Outdoor folding chairs are those accessories that you always need and never seem to get right. They are usually flimsy, easy to damage and break and in may cases clumsy to open and forgettable. We decided that it was time to put things straight in the world of foldable chairs. Those amazing little times that are so important when you go out camping, hiking, relaxing at the beach or just driving around and need a place to sit. Some fly reels under $200 I also owned in the past. Great affordable fishfinder GPS combos that helps to find the right fishing spot. There are many reasons to want a foldable chair, and whatever they are, a good foldable chair needs to be sturdy, durable and easy to carry. The folding chairs are very comfortable to transport. Here is a comprehensive buying guide to choosing the best foldable chair as well as tested and proven. There are so many models to choose from and so many manufacturers that we had to test hundreds of options before we could come up with this list. What we did learn from all our hands-on testing is that there is much more to a folding chair than meets the eye. Let’s take a look at all the features you need to be aware of before buying your next folding chair. The types of folding chair vary between the minimal camping folding seat or stool, which is lightweight, easy to carry and easy to stow. These are the perfect hiking and camping companions you can choose. The next level is the standards folding chair for everyday use. They are usually sturdier and heavier, in most cases provide an armrest and come with a carry bag. The final level is your heavy duty and additionally padded folding chair which is heavier and used to support heavier loads. More luxurious options will provide the most stability, comfort, and features, however, will weigh the most of the three types of chairs. These types are usually reserved for home use, or for heavier people. 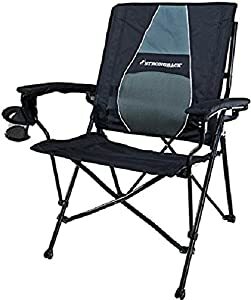 Backpacking chairs should weigh no more than 2 lbs., (1kg) while camping chairs where you drive to sites can weigh more, but no more than 5 lbs. The heavy-duty chairs will usually weigh more than 5 lbs. Camping chairs will weigh in at 5 lbs. and go up to 15 lbs. depending on the detail and structure. Camping chairs are not usually good for long walking trips and are best suited for vehicle transportation. The best and lightest frame material used is Aluminum. However, the heavy-duty ones will most probably a sturdy coated steel rod. Some cheap variants come in plastic, but in general, the aluminum and steel and versions are proving to be more popular for wet environments. The fabrics will differ, but in general, they are either Nylon or Polyester, which are used for durability, waterproofing, and strength. Some chairs will come with the cotton-based material, that is sometimes more suitable for people with allergy issues. Nylon dries faster, so it’s a more suitable material for wet and humid climate use. Most of the products come in a polyester mesh since it is much more affordable than nylon and is less “slippery” than nylon surfaces. Since foldable chairs are designed for weight and transportation, they are light enough to be picked up with ease by one of their frame struts. The camping foldable chair or stool is sometimes given even more foldability, reducing it to a tight package that can be easily stowed in a backpack. The more luxurious chairs will come with an individual carry case or bag. The minimal folding chairs come with few features and are not designed for comfort, only for functionality. The larger and more luxurious models will come with a different attachment, such as cup holders, armrest pads, lumbar support padding and storage pockets stitched to the back of the chair. Since fishing and camping are outdoor sports that exercise intensive, some camping and hunting chairs will come with an additional lumbar support feature. Fisher people will probably seek this option since they tend to sit for hours in silence while waiting for a bite. 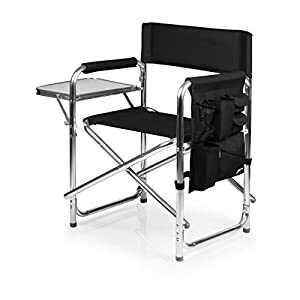 Apart from hiking and mountaineering chairs, most camping and recreational folding chairs will come with armrests, and some will come with footrests. The addition of an armrest helps with eating and general comfort, the footrest is a personal like or dislike, and that is what they usually as a detachable option. These additions are very popular, where cups of hot liquid or ice-cold beer cans can be nestled off the floor, freeing you to eat, talk and use both hands without having to worry about your drink falling over by your feet. Recently, more and more models come with extra pockets sewn into the fabric. These pockets are used to store all kinds of items from a spare bottle of water, sweets and other refreshments to sewing kits, tools and even extra ammo or fishing supplies. A handful of folding chairs come with an extra shade, which is usually from the sun. 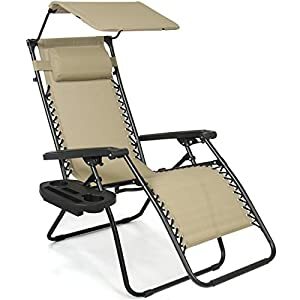 Other chairs come with an umbrella loop that enables you to connect a portable sunshade or umbrella to the chair. This is usually the preferred style for fishermen. Now let’s take a quick look at size and stability. It is not enough that a chair has all the features of a sofa, they must be practical, stable and be able to carry your weight. This is why we always state that trying out a chair is like trying on a pair of pants, they either fit you, or they don’t. This is why we decided to provide you with an extra insight on every item we reviewed, and only the most reliable, sturdy and stable chairs have reached this list. Timber Ridge’s director folding chair is designed for absolute control over your seating area. It is made for out of a sturdy aluminum frame that is easy to fold open and lock into place, and easy to fold back closed. The fabric used is a breathable polyester mesh that supports the frame integrity allowing this chair to seat up to 300 lbs. of body weight in its 9lbs frame. This chair comes with plastic molded armrests for extra comfort, and it supports a side tray with cup holder. This Timber Ridge camping chairs are very light and easy to carry and are extremely good value for money. 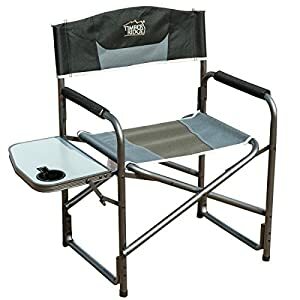 This is a great folding chair to invest in, and it’s best if you buy one for every member of your family and add a couple of guests too. This chair is also great as an additional folding chair option at home when you have parties and not enough seating. 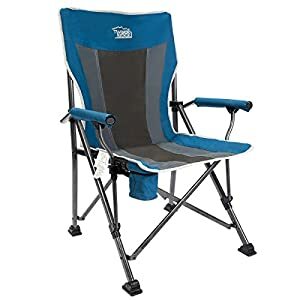 My Take: This is a great chair, while it does weigh in at 9 lbs it is easy to use, and the side table is a great addition, especially when you get those messy campfire barbeque meals. Since its what I call a middle of the heavy weight range, not 5 lbs but not over 10 lbs., it is a great addition for those long campfire nights in nature. 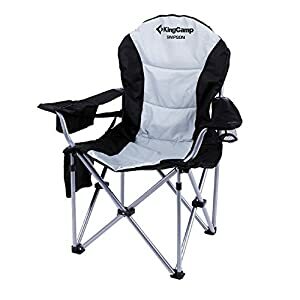 The KingCamp deluxe folding chair with lumbar support is a well built and well thought out folding chair. It comes with a steel tube frame that can support up to 353 lbs. of body weight, and the extra material and padding provide one of the most comfortable camping chair experiences you will find. It does have a carrying weight issue, it’s on the heavy side weighing in at 11.3 lbs. So carrying more than one at a time can be an issue for some people. This is a really sturdy, solid and comfortable chair. The fabric is 600D polyester, and the lumbar support truly helps when sitting for long periods of time. This unit comes with a carry bag to make it easier to heft. 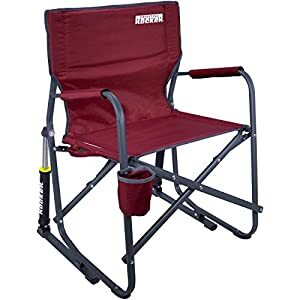 Since it is so sturdy, this makes a great addition to home chairs for large parties, and due to its design is great for long fishing trips, where you need to sit for a few hours. My take: I like it, I like it, and I like it…so will you. It is a heavier model, and it is a comfortable model, but it delivers everything you could ask for, so I have a couple always ready for our next camping trip. This is Browning’s light, camo camping, and hunting chair. Designed for minimum space, lightweight for easy carrying, and fast deployment (quick to open and fold). This folding chair provides you with the basics and essentials that a chair provides. The fabric is Browning’s proprietary Realtree® Edge™, and the frame is powder coated steel that supports up to 300 lbs. of body weight. The chair comes with a carry strap for easier holding, and it weighs in at 6.5 lbs. Which is a reasonable weight for short distances when considering all the other equipment you might be bringing along with you. Take note that this seat is a low sitter, which means you will be closer to the ground, and your legs will be prone rather than bent. My take: if you like to fish (freshwater of course) and need a sturdy and comfortable seat, this is a great choice. 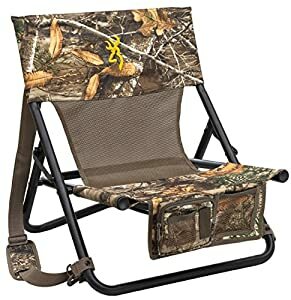 Its also a great hunting/camping combo seat. This is one of the leading lightweight, heavy load bearing folding chairs on the market today. It is also extremely comfortable. This is one of the preferred backpacker and hiker chairs around, and it’s understandably so. The Chair One frame is made of Helinox anodized aluminum poles that provide a 320 lbs weight-bearing frame while weighing in at only 1.9 lbs. The fabric is a 600D polyester mesh. The overall design is ergonomic and comfortable. MY take: Aaaah, what can I say, I love Big Agnes, this is one of the best folding camping chairs you will find, and its lightweight enables you to carry a few them at a time. It comes with a nifty carrying case too. Honestly, the last time I went skiing, I took this with me, and just sat under the sun with a cup of hot chocolate way up in those Colorado mountains. When it comes to comfort and ease of access, the Coleman® Cooler Quad Chair has it all. 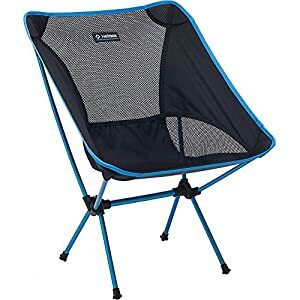 This camping folding chair is built with a strong steel frame and is covered with polyester mesh that is designed to hold more than a person. The steel frame supports up to 325 lbs. of weight while only weighing in at 7.7 lbs. 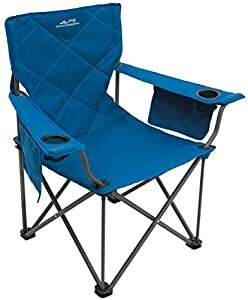 In fact, this amazing chair comes with 4 can coolers, made of polyester mesh that will retain the cans cold temperature while you enjoy sitting without getting up to the next can. It also supports extra pockets a head cushion and padded armrests. Apart from being easy to open and close, it provides adjustable armrest heights and a carry bag to make carrying easier when folded. This chair comes with a 1-year limited warranty. 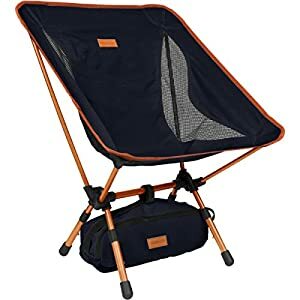 My take: The Coleman folding chair is solid example of a comfortable camping chair that provides a lazy experience while enjoying natures backyard. This is another fine product from Timber Ridge, and as expected it is heavy duty but light. This camping chair comes with a strong steel frame that can support up to 300 lbs. of body weight. The fabric is their durable polyester mesh, and the unit weighs 14.11 lbs. This is not for backpacking, but for camping. It is a solid, strong product that comes with a padded foam seat and padded armrests for extra comfort and also provides a swivel cup holder. My take: The Timber Ridge is suitable for campers seeking a more stable seating arrangement. The extra padding and lumbar support are great of all ages, but especially for the over 60’s. I mean this, I bought one for my father after he was 70 years old, and he ended up sitting in this most of the day. It drove my grandmother crazy. 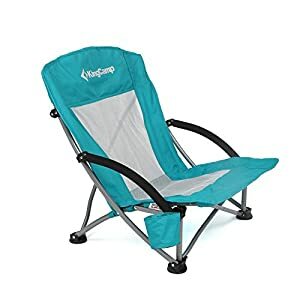 I also present you with another KingCamp product, this time it’s their low-slung camping chair. This model is lighter and easier to carry. It has a steel tube frame covered by a 600D oxford polyester fabric and can support up to 300 lbs. of body weight. The chair weighs in at 6.6 lbs making it a middle range weight, that is best transported by car to the most destination rather than supported for long walking tracks. 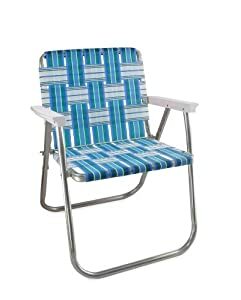 This is a great chair for beaches, camping sites and lazing about by a pool when there are no available deck chairs. My take: If you want a solid low-slung seating arrangement and prefer a more comfortable and reliable brand of chair, then the KingCamp models are for you. The last time I used one was when a friend of mine invited me to go visit a waterfall in the Philippines. He had two and we each carried one for a six-mile hike from the road to the falls. It was well worth the time and effort. When it comes to technology and chairs, you will need to a Wildhorn Terralite. This company has managed to combine leading-edge engineering with a simple folding chair. Apart from all their snazzy names, such as the Terragrip feet used to stop sinkage in soft surfaces, they have managed to design an ultralight camping chair that only weighs 2 lbs. and supports 350 lbs. of human body weight. The frame is aircraft aluminum alloy, and the fabric is a durable and fast-drying polyester mesh. You can remove the Terragrip feet, making the chair even lighter to carry. This is a leading hiking and long trekking chair that can be easily carried and quickly deployed. The Terragrip feet actually do help when you want to sit on sandy or muddy surfaces. These chairs frame weight to support weight ratio is one of the best you will find. My take: I have one, I have one, and its great. I want another one, and would like more, surrounding myself wit this chair in any scenario is a backpacking hiker’s dream. Its light weight, only 2 lbs. and strong while being one of the most comfortable chairs around. What more can you ask for? I have one, I always take it with me when I go to the beach, since it really does withstand the sand slippage that most other chairs fall into. When it comes to simplistic comfort and non-nonsense designs, YIZI is a leader in the pack. The YIZI GO was designed for hikers and backpackers since it weighs in at 2 lbs. It can support 300 lbs of body weight and is fast and easy to deploy. This model comes with an ergonomic body support design that supports your back while you relax back into its breathing fabric. The fabric is a 600D polyester mesh that provides both strengths with its double V stitching, durability, and airy lightness. This is a single piece design, meaning you open and close it in one swift action. The seat comes with a storage bag that sits under the seat, and the closed seat provides “daisy chain style” tie downs all over so you can manipulate how you attach it to your backpack, bicycle or motorbike. It comes with a storage bag for safe and clean storage. My take: This is similar to the Terralite, but without all the fancy names and special legs. Its straight forward light to carry, easy to use and comfortable and budget friendly. Actually, this is a very good example of a lightweight, sporting event folding chair solution. The Strongback folding chair is a sturdy and well-designed chair that provides excellent lumbar support. This chair is made of a steel frame covered in 600D polyester mesh. It weighs in at 11.9 lbs. and can support up to 300 lbs of body weight. The design is “director chair” style, meaning it is a square support system with full back support and sidearms. The Strongback comes with padded armrests, a cup holder, and a carry bag with shoulder straps for easier carrying. The back comes with an added lumbar pad for extra support. Its weight makes it ideal for camping and home use. My take: If you are seeking a solid, stable seat that can be sued at home as well as outdoors. This is the one to get. It’s a classic model with a classic design and is great as additional seating in picnics, camping and just around large backyards for a family barbeque. If you want retro and want a chair that takes you back to the 50’s and 60’s, you don’t need to look any further than the amazing Lawn Chair USA. This family-run company opened up in 2010 with the intention of supplying basic folding chairs, the ones our parents and grandparents used and are seen in all those classic Hollywood films. Lawn Chair USA gives you a no-nonsense seaside and lawn chair that has been part of the American heritage for over 50 years. As the saying goes,” if it isn’t broken, don’t fix it.” This chairs design is perfect and simple. The frame is an anodized aluminum covered in polyester fabric reminiscent of the 20th Century classics. The chair supports up to 225 lbs. My take: I love it. I actually have two, they sit on my lawn like garden gnomes, that’s how decorative they are. Although they are also sturdy and very good chairs to carry around whenever you to the beach. Actually, I have a more than two, and at family et togethers, when the grill is on and the game is being roasted, these chairs dot the site. If its style and a comprehensive seating arrangement that you are seeking, then don’t read any more than this product review. The Oniva sports chair comes in a plethora of colors and has one amazing feature; everything. Let’s start with the design, it is a classic “director” chair design with armrest and back support. The frame is light yet sturdy aluminum frame supported by a 600D polyester mesh fabric. The polyester mesh fabric comes with one of the most comprehensive pocket combinations you will find. The frame supports up to 300 lbs of weight, and the chair weighs 10.25 lbs. 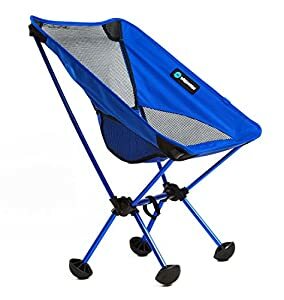 This folding chair comes with a fold outside table that can support up to 10lbs of extra weight. The armrests are padded for extra comfort, and the side pocket unit includes storage for all kinds of goodies you might want to have close at hand, ranging from mobile phones, cameras, to cans of food or a good old-fashioned paper book. My take: Camera, Lights, Action…yup, don’t cut the scene. This is a nifty, snazzy chair that delivers everything you could ask for. It’s the ultimate lazy campsite chair that lets you sit down and not get up. Just don’t forget to pack it full of goodies or you will have to get up anyway. My mum loves it, but then she is a 1950’s gal. The Alps Mountaineering King Kong Chair is the world’s strongest folding chair, with the best weight support to chair weight ratio on the market. So, if its strength you need, this is what you will get. This unit is of a strong coated steel frame supported by a 600D polyester fabric mesh. The chair weighs in at 12.5 lbs. But can support up to an amazing 800 lbs. I don’t know if you will find 800 lbs to test it out, but it can support this weight, making this the king of folding chairs. Regarding comfort, the backrest is padded, and the armrests have cup holders formed into their padding. So, this chair also delivers in comfort as well as in strength. Overall, a great buy for heavy travelers. My take: I actually went out and bought one of these for a close personal friend that weighs in over 300 lbs. This is an amazing seat, and well deserves the title. Its so strong and stable that my friend once fell back on it with plate full of fries, and guess what, it didn’t break, buckle or slip. Mind you, we were all on the floor rolling around laughing (ROFL) while he continued to chew his fries. Oh, and the beer can didnt spill a drop. Where would I be if I didn’t add a little extravagance to my review? Best Choice Products has a great lightweight and versatile Zero Gravity Chair option. This chair is a folding camping chair that is not designed for hikers or backpacking. This is a carry in the car and then sit back and enjoy full-sized chair with sunshade. This chair comes with a steel frame covered by their proprietary fabric Textilene that provides UV shade, so the sunlight shade actually does more than just block out the light. 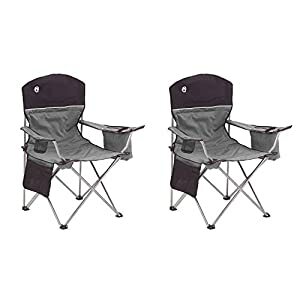 The design is a full-sized reclining chair, so is not fair to compare it to standard lightweight camping chairs, but it has to mention since it is the best in its own category. The chair can support up to 250 lbs. and weighs 20.5 lbs. If you are going on a camping trip, then this is the chair you want to take with you. Just one of these will make that chair fight become a reality. My take: I like these chairs, especially at night after a long day walk. Just reclining with a beer or a glass of something stronger. I don’t use the shade, but it works great and this chair is really solidly built. What I like most about it is that is a budget friendly reclining chair that can suit every place you want to put it. This review will close with a great classic GCI Outdoor® Freestyle Rocker™ folding chair. This chair is a solid design, weighing in at 13 lbs. and provides a solid powder-coated steel frame that can support 250 lbs. The weight is due to their rocker mechanism that gives this seat an edge in comfort. It’s well worth the additional weight when the end product can lull you to sleep in minutes. This seat is easy to handle and transport, but its weight limits it to car driven camping rather than hiking or backpacking vacations. My take: I sometimes smoke, sorry, I wish I could stop but I’m sooo weak willed and heck, I only live once. So, there I am rocking away with a good fat cigar, a glass of 12 year old single malt whiskey and the sunset. My wife wont let me sit on it any more, she claims I forget everyone and dream off into some fantasy dream world. She’s right, this rocking folding camp site chair is everything and more you could want, and afford to purchase.